One-third of the Puerto Rican people live in the United States. Most have come in search for the better life promised them by US. propaganda. Instead they found slum housing, poor or miseducation, low-paying jobs, and constantly rising unemployment, in a society determined to destroy their cultural identity The film traces the growth of the Puerto Rican struggle by focusing on the development of the Young Lords Party. 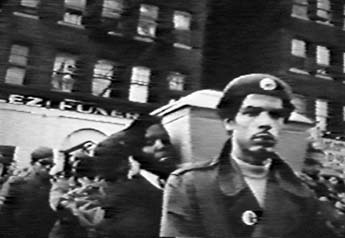 A Newsreel crew in New York City worked closely with the Lords for a year and a half-participating and recording the events and programs which the Young Lords are using to make significant advances in the Puerto Rican struggle. The film deals with the main problems in the Puerto Rican community-health, education, food, and housing. These problems become the focus of the Young Lords Party.